* Community painting project- they painted playground equipment, we painted fire hydrants on Denison St.
*Children’s Outings”-they took children from Muskogee Day Nursery on a nature walk-we accompanied children from Project Transformation Summer Literacy Program on a literacy based field trip and scavenger hunt at the Farmer’s Market and to a live theatre experience at Muskogee Little Theatre for their Summer Youth Production. *Bicycle Safety & Biking Event-We worked the Muskogee Parks & Recreation Youth Triathlon with a bicycling component, timing races, encouraging participants, and handing out helmets, water and medals. *Clown College with the Shrine Clowns- We were able to connect with the Bedouin Shrine Clowns who were more than happy to do this with us. As of the date of this report, we have participated in the Shrine Car Show and last weekends Shrine Circus. We have attached pictures at the end of our report. The rest of Our Story is about our experiences with the clowns. When the idea first came to us through the photos and news articles from Martha Alford we weren’t sure who to contact. In April we worked an event out at Hatbox for the library called Touch A Truck. The Shrine Clowns were there too and we were able to strike up a conversation, exchange information, and most importantly they were able to see how hard our youth work when they are involved out on a project. We had youth helping with the story time, assisting kids in getting on and off large vehicles, and running the arts & crafts table for the Children’s Science Museum (a group that uses us at all their events). WE made the contact after the event and set some dates. The Shrine Clowns were incredible! They initially spent a Saturday with some of our youth that committed to learning “to clown”. We even had a couple of the clowns who had been part of the first Clown College back in 1993 talk to the volunteers about what that first Clown College was like. The day included a historical overview of clowns from the Roman era to present day clowns, information on the different types of clowns and how they dress and make-up their faces (who knew? ), and then the fun part-helping the volunteers chose a clown persona, apply make-up on them, dress them up and teach them a few skits. They ended the day with lessons in making balloon animals and props! Crazy fun and very noisy as we learned just how much air can go into a balloon-or can’t. We have since purchased a few balloon pumps, lots of balloons, thrift store clothing for clowning out and some of our own make-up. 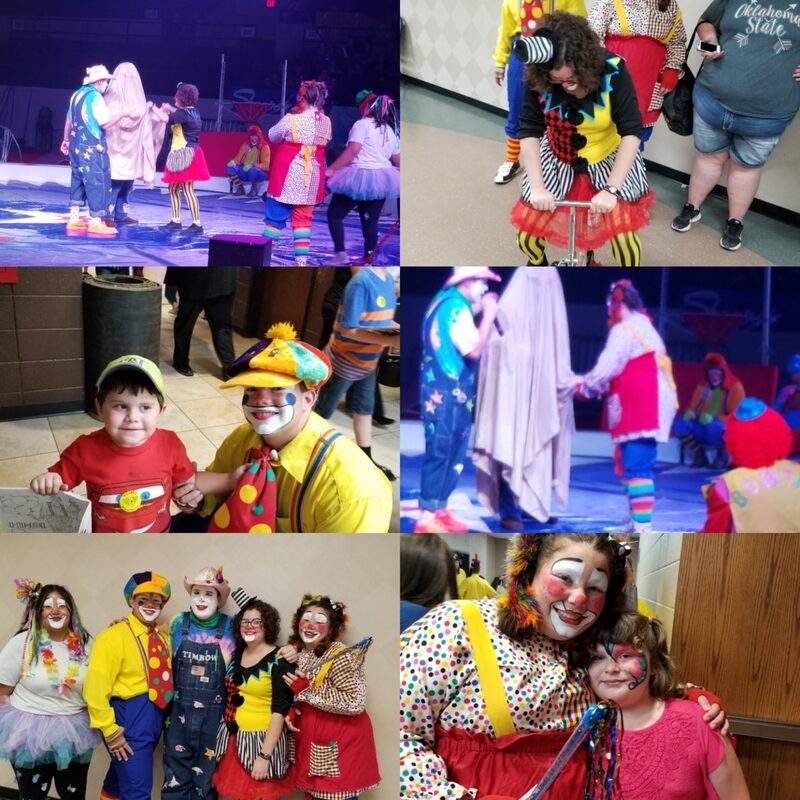 Our clown brothers were so proud of how the youth were able to jump right in and participate at the circus last week. We will also be making some appearances at a local day care, nursing homes and working with the Shrine Clowns at their upcoming Barbeque Fest in a few weeks. I can’t say enough about how they spent their time and resources to teach out youth. Not only are they learning about clowning but they are also learning about all the things that the Shrine does for children who have been burned. This project was and will continue to be just a part of what YVC does during the summer and throughout the year, but it is a great example of how we work to connect our youth with those groups and individuals who are actively helping meet needs in our community. If we get to clown around and squirt a few faces with water roses or make kids smile with balloon hats and swords, all the better.